The Red Snapper (Lutjanus campechanus) named “Little G” (Tag ID: GFR6144) was originally tagged & released by angler Thomas Frey on January 28th, 2016 while fishing with Captain Daniel Zier and mate Garrett Frey aboard the charter boat Second Nature, out of Key West, Florida. The Red Snapper was measured to be 20 inches (50.8 cm) total length and had an approximate weight of 4 pounds. The Red Snapper was recaptured 35 days later on March 2nd, 2016 by angler Ian Asher fishing with out of Key West, Florida. During that time period, the Red Snapper most likely moved to the deeper waters while still following along with coral reef or some type of rocky bottom structure. 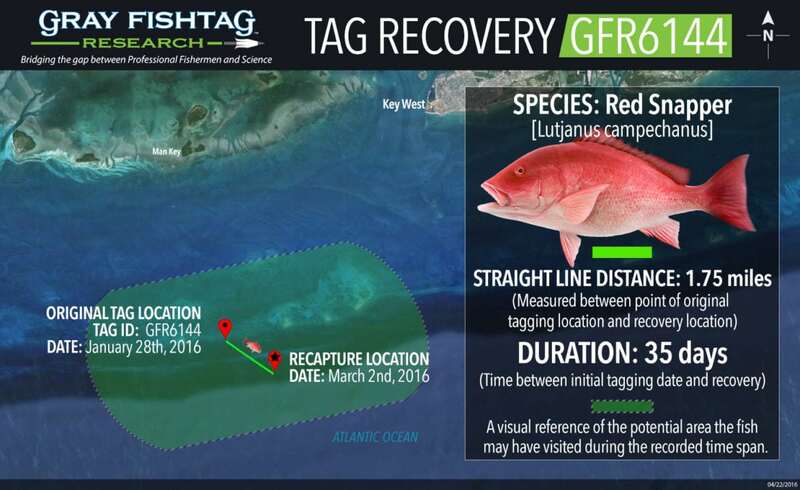 The recapture was in the waters off Key West, approximately 1.75 miles away from the original tag location. At the time of recapture, the Red Snapper had an estimated length of 21 inches and weight of 5 pounds. Red Snapper have a pinkish red body color with a white underside. They average 24 inches in length and reach maturity at between 12-16 inches. The Red Snapper inhabits offshore waters on the continental shelf, over rocky bottoms, banks, and deep reefs. The older and larger snapper tend to prefer the colder, deeper habitats. The Second Nature charter boat crew will receive some Gray FishTag gear for their tagging efforts. Tag recovery angler Ian Asher will receive a pair of Costa Del Mar sunglasses, a Tag & Recovery Certificate, and Gray FishTag gear for reporting the tag recovery. The tagging and research efforts is made possible by our research centers and sponsors AFTCO, AA Video, American Fishing Wire, FECOP, Mold Craft, Costa Del Mar, CR Primo Fishing Tackle, Shadow Graphics, AquaWorld, Crocodile Bay Resort, Grande Alaska Lodge, Los Sueños Resort & Marina, Marina Pez Vela, The Pisces Group and The Zancudo Lodge. The success of the program is made possible by the participation of the hard working fishing professionals and the generous contributions from our partners and donors. Any contribution is tax deductible and will go directly to support our cause and help the growth of the program.